This is the fourth in a series of guest posts from select authors in Protagonize‘s creative writing community. Do you have something to say that might be of interest to our members? Feel free to contact us with blog ideas and share your passion for writing with our readers. …while I tell you a story. At some time in the afternoon, on the first Tuesday of September 2008, I started a little story on Protagonize, where I had been a member (as Tasha_Noble) for a little over four months. It was a story called Paddytum. I started it as just a bit of fun, and as a collaborative story, and wrote two chapters that day, hoping I had given people enough of a start that someone would soon add to it. A week later, after nobody had added, but lots of people had commented, saying ‘Please write some more’ or words to that effect, I wrote a third chapter. After that, I think I knew it was down to me to carry on with it, because nobody else seemed to want to touch it, and it had become mine. We didn’t have Solo stories, as such, on here, at that time. Not officially, anyway. Nick added that option a lot later, and Nick turned Paddytum into one of the very first Solo stories on the site. I added to it infrequently, getting to only eight chapters in the course of one year, and all the time, it was gaining readers and attracting its own (nagging) fan base. By the time I deleted it from the site a couple of months ago, the eight chapters I’d written had been ‘favourited’ by 41 members, rated 149 times for an average of 4.91, and clocked up 123 comments, a great many of which urged me to get it finished, get an agent, and get it published. In July last year, my husband gave me a really nice birthday present. He paid for me to attend a Writers’ Conference. (I think he thought it would be an investment in my future.) There, I was surrounded by people who were toting around their one novel, some of whom had been working on their Work-in-Progress for several years. I had also written a novel – two, actually – during my first NaNoWriMo the previous November, but I didn’t think of either of them as very good. I wrote another one last November too, and hated it. One of the reasons writers attend conferences is to show off their WIP to published authors, editors and agents, to get their opinions. The trouble is, I didn’t have a WIP. All I had was several stories I’d started on Protagonize, some of which could possibly be turned into novels – The Life and Time of Bella Pleasance, Waking Up With Henry, and Paddytum, plus the two novels I’d finished writing. I was a writer without a purpose. As part of the conference fee, I could book up to three One-to-One consultations with published authors, agents and so on, sending them a few chapters in advance, so they could discuss my work and give their opinion on its suitability for publication. I chose a children’s author, and two others, one of whom wrote mainstream fiction, and the other who wrote romantic comedies. I sent each of them a different piece of work – my Young Adult novel to the Children’s author, Paddytum to the mainstream fiction author, and No More Miss Nice Guy to the one who wrote Chick Lit. I spoke to the children’s author first. She said my writing was good, but I needed to work on getting more conflict in the book. Both the chick lit lady and the mainstream one were extremely enthusiastic about the things I’d sent them. Especially the one to whom I showed and discussed Paddytum. She said she had picked up the three chapters I’d sent her, having read in my blurb that it was about a middle-aged man whose teddy-bear had started talking to him, and expected it to be utter drivel. ‘I couldn’t stop reading it,’ she said. ‘You absolutely have to finish it!’ Unfortunately, that was what the other lady had said about No More Miss Nice Guy. So I went home from that conference nearly as confused as when I’d arrived. Should I finish Paddytum, or revise No More Miss Nice Guy or the YA? And what did I do? Nothing. I added another chapter to Paddytum, making it up to eight, and then lost interest again. Then, early this year, I heard that a publisher of non-fiction, whom I’d met briefly just before I joined Protagonize, was looking for authors, as we was breaking into fiction. I thought about it, and eventually decided to drop him a note, and he gave me the go ahead to send him the eight chapters of Paddytum I’d written. The author who’d liked it so much at the Conference had told me she thought its popularity on Protagonize would be a good selling point, so I told him about that, too. I included a handful of the 123 comments, including the ones which said it should be published, For good measure, I also sent him the first six chapters of No More Miss Nice Guy. And then, I waited a few weeks. I was about to give up hope when I had an email from him, saying that he was keen to publish Paddytum. And Miss Nice Guy. He didn’t specify in what order. That was up to me. It would have made more sense to go for Miss Nice Guy, but I had more enthusiasm for Paddytum, and felt sure I could finish it, and revise it, over a few months, and we agreed on a publication date of October this year. There’s nothing like a deadline for focusing the mind, I got to work straight away. I brainstormed the plot, and mapped out the rest of the story. The word count stood at 10,500 words, give or take, and it’s now close to 80,000 words – a pretty decent length for a novel. There’s still work to do, revising and rewriting and polishing it, so that when it goes to an editor later this year, it’ll be as good as I can possibly make it. But, even in its uncut, unpolished form, I absolutely love the story and my characters to bits. Especially Rob, my main character. I haven’t given him an easy ride, but he’s risen to all the challenges I’ve thrown at him. Between you and me and the gatepost, I think I might have fallen a little bit in love with him. Whether anyone else has, you’ll have to read the book to find out. When I started Paddytum on Protagonize, I referred to it as a fairytale for grown-ups. It’s not really that any more. I would describe it now as a Supernatural Mystery Romantic Comedy. While I’ve been writing it there have been moments which have made laugh (lots of those), cry, gasp, and sigh contentedly. I’ve enjoyed almost every minute. I hope it has the same effect on my readers. I took an unconventional path to publication. You shouldn’t really pitch to an agent or a publisher with an unfinished book. Especially when it’s only eight chapters so far and you don’t even have an ending! I was lucky. If I hadn’t taken a chance, and had someone willing to take a chance on me, I would have finished the novel, eventually, revised and edited it within an inch of its life, and then prepared a carefully written synopsis, before sending it out into the world to be rejected a few times, like normal writers. I was lucky enough to be able to bypass that process. But that doesn’t mean I get to skip all of it. I suppose the way it’s happened for me has propelled me to ‘second novel’ mode. When authors are signed by a publisher, they’re often given a deadline to write their next book. I guess I could say I’ve been fast-tracked to that stage. But I still have to produce the best book I can possibly write, because it’ll be my first novel, and I want it to be something I’ll be proud to put my name to. And, more importantly, I want people to buy it, and feel the hard-earned money they paid for it is money well spent. And that they’ll be able to recommend it to their friends, and want to buy my next book, too. The differences between publication by an independent publisher like mine, and a big publishing house are very few, these days. I won’t be paid an advance. But many big publishers do not pay an advance, either, especially to first-time authors. All my earnings will be dependent on sales of the book. I’m not expecting anything life-changing! Another good thing is that I have a lot more say in the cover design than I would with a big publisher. I had the choice to have the cover done by their own designer, but opted to use my husband Glyn’s design instead. 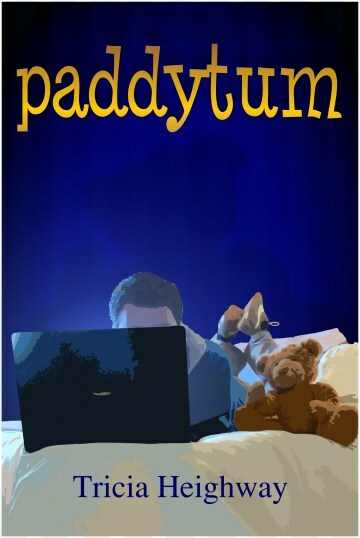 If you’d like to pre-order Paddytum, it’s available now, from Hirst Books. A bonus you will get for pre-ordering it is a special thank you from the publisher — your name will be printed on a list at the back of the book. (Hirst Books does this with every title they publish, and I’ve seen feedback from people saying it gives them a nice feeling to see their name, and makes them feel like they’re directly involved in the success of the book.) and your copy will be signed and dedicated by the author (hey, that’s me), and is guaranteed to reach you before it goes on general sale. By the way – existing Paddytum fans – what I recently called the Paddytum Massive. There’s a bonus for you too. Before I deleted the story from Protagonize, I copied all of those 123 comments and pasted them somewhere safe. Anyone who made a comment will also be mentioned – either by your real name (if I know it) or your Protag handle — in my acknowledgments. So you might possibly have your name printed in the book twice. Editor’s Note: You can become a fan of Paddytum on Facebook here. Congrats, Trish! 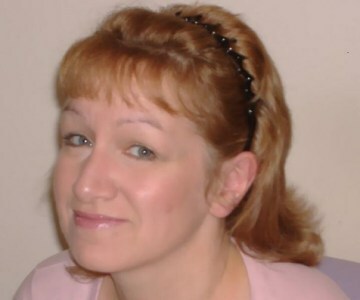 Tricia Heighway gave up a long and successful nursing career in July 2008 following a neck injury which left her with permanent nerve damage in her right hand. She decided to try and be a full time writer instead. She lives in the south-east of England with her husband, two teenage children, an elderly cat, and a selection of gerbils, and is constantly battling an addiction to reality TV shows, which she excuses with phrases like ‘It’s research!’ She knows she is in denial about that. Paddytum is her first novel. This entry was posted in General, Guest Posts, writing and tagged books, getting published, hirst books, paddytum, Publishing, tasha_noble, tricia heighway. Bookmark the permalink. I’m really looking forward to reading it, and one of the main reasons is I think I know you’re writing style a bit, so it will be NEAT seeing it on the printed page! Could not have happened to a better writer — I’m not surprised it did! A huge congratulations! Great things happen to talented people. I’m pre-ordering now! Any publication from a Protagonizer only adds value to the site for all of us, so a big thank you to your husband as well for gifting you the Writers’ Conference! I’m excited to see No More Miss Nice Guy too, I never had a chance to check that out! Great going Tricia and a really helpful and informative post for us wannabe published authors. Best of luck, you’ve already got a pre-order from me! I’m gonna keep notes on this for future reference… maybe some of your luck and skillage will rub off on me eh? Thank you so much Trevor, ‘zade, Dark and Spook. Something I should add (and Spook reminded me of this because I just replied to her post on the Facebook fan page, saying the same thing). Even if you read the first eight chapters originally on Protagonize, don’t worry because they’ve been rewritten – and greatly improved (I hope), not to mention at least 32 chapters you haven’t read yet. Well done. I’m going to pre-order this. One day in the future I want to publish one of my books and this is a real inspiration. It gives you that little bit of extra hope to know someone else got there. You’re all so lovely and supportive. and RackSeven, I’ll only make sure it’s personalised, but I’ll most probably do yours in rhyme. Oops, Rachel, that was supposed to be ‘NOT only’. Thanks, Lucy. Well, you’re certainly getting lots of practice, and they say the way to become a good writer is to write a lot and read a lot. I’ve just put in my pre-order. I would have done it sooner but I’ve had no internet access for the last four days. Sorry excuse, I know, but it’s all I’ve got. Thanks Marc. Hey, no internet is good to have occasionally, though. We should all have a break from it sometimes. Congrats, Tricia. I think Paddytum was one of the first stories I ever read on here when I joined last year, and it’s great to see what’s become of it. The cover looks great. Haha, I can’t for the life of me remember if I commented on it or not. Could you sign mine “Anne Rice”? 1) I’ll sign it *in* rice, if you like. 2) I could sign it ‘Anne admirer’. 3) Would you like it dedicated to ‘my good friend, Stephenie Meyer’? Oops, I meant to comment before. Much congratulations, Tricia! I’ve done a fair number of happy dances over this and everyone in my family has had to listen to me bubble over it. I love this story and can’t wait to read the rest. You deserve this – for your talent, your generosity, your determination and just plain wonderfulness. I am going to be buying a copy. – nothing can stop me. Launch party? Just tell me where and when…and seldom will be there with bells on. Well, my publisher has put my name down as an ‘attending author’ at an event in Swansea in September, which is a surprise as he hasn’t asked me if I’m free to attend, and the book’s not supposed to be out until October. I’m hoping it’s not a mistake. I’d love it if the book is ready by then. Such a well deserved honor for you, Tricia :) I’ve already ordered mine, and will spread the word about the book. The cover looks great! Your husband did a great job. I’d come to your book signing, but I’ve no way to get to England.. hehe :) If you ever find yourself in the south, I’m sure all the Mississippians of protag will come out and support you. I’d love to visit Mississippi, or anywhere in the US or Canada, but it’ll be a long time before I can afford to, so I’ll have to stick with visits via here and Facebook for now. Pingback: My Protagonize Interview « Call Myself a Writer?